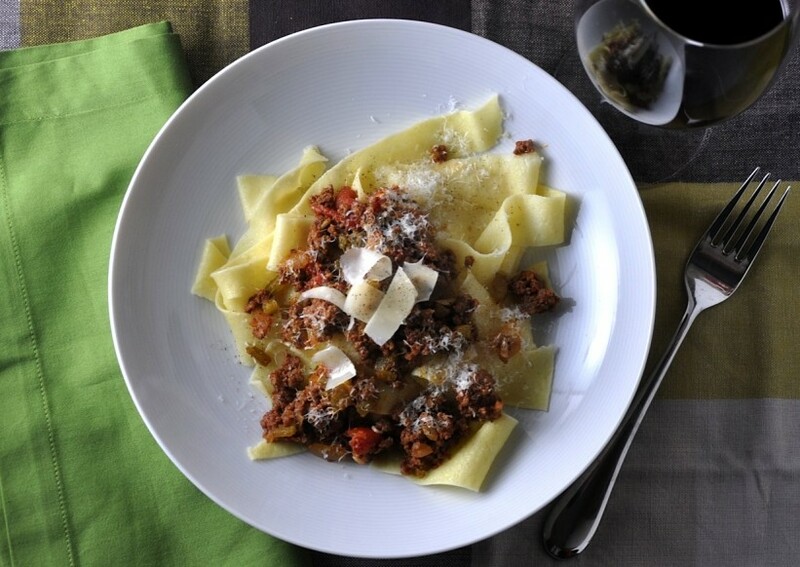 Using Sikorski Raw Farmer Sausage in this ragout is a traditional technique that produces a superior flavor to plain ground meat. This simple recipe highlights the flavour of each component. 1. Slice the onion thinly. 2. Squeeze the sausage out of its casing and reserve the meat in a small bowl. 3. Heat up a large sauté pan on high heat. Once it is hot, add about 1 oz of cooking oil and the raw farmer sausage. Sear the meat until it is a nice golden brown. To prevent the meat from burning, turn the temperature down slightly, keeping in mind that the pan must stay hot to achieve true caramelization; otherwise, the meat will just steam in a warm pan. Keep the sausage meat in chunks to highlight its origin. 4. Once the meat is browned, add the onion and turn the heat down to medium to caramelize the onion. Cook the meat and onion together for about 10 minutes. 5. Add the wine and deglaze the pan (scrape any brown meat from the pan) to retain maximum flavour. 6. Once the wine has evaporated, add the tomatoes and simmer the sauce on low heat for 30-40 minutes. If the ragout gets too thick, you can thin it with some chicken or beef broth if you have some on hand; otherwise, water will do. 7. While the sauce is cooking, set up your food processor, or use a stand mixer with a paddle attachment and mix the pasta ingredients. Then kneed by hand to bring together. If you’re not using a food processor or mixer, create a well shape with the flour on your counter, and mix the wet ingredients into the middle of the well with a fork, slowly incorporating the flour. Once the dough becomes too thick to work with a fork, use your hands to bring it together and kneed by hand for a few minutes until it becomes soft and elastic. 8. If you have a pasta roller, roll out the dough to setting number 5. If you’re doing this by hand, roll out the pasta to about 1/16 inch thick. Then cut the pasta into 1-inch strips or triangles and dust in flour to prevent sticking. Keep the dough nice and thick – the pasta should be as much of a focal point as the ragout. 9. Set up a pot of salted water and bring to a boil. Once the ragout is ready, add the pasta to the water for no more than 1 minute. Incorporate the butter and mix the pasta until it is nicely coated. 10. Serve with the pasta on the bottom, covered by the ragout. Top with freshly grated Parmesan and fresh basil.